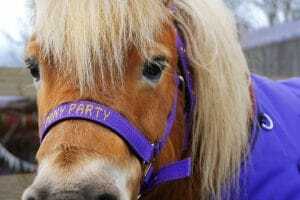 Our fabulous pony birthday parties are the talk of the town. Our staff and ponies are dedicated to making your Shetland Pony Party a resounding success and a magical memory for your child! We’re easy to get to from a wide area, being in Cobham, Surrey with good access to the A3 and M25. 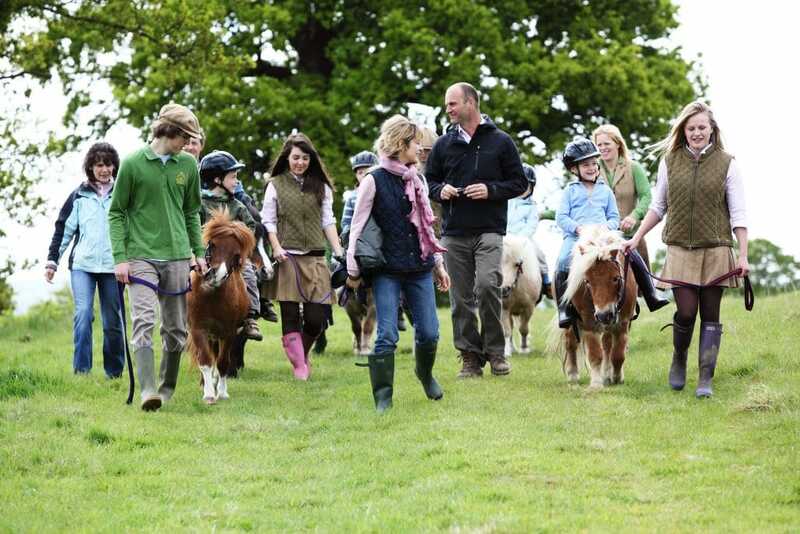 Shetland Pony Parties are available from March – November by appointment only. At your birthday party our six uniformed staff will introduce the children to the ponies and serve your drinks to your adult guests. We then saddle up six ponies and go for a ride together through our meadows. Our ponies are placid and easy to ride. It is fun and enjoyable for both the parents and children. On our return we unsaddle the ponies, offer them a drink and then it’s time for tea. Our staff manage the ponies whilst you provide the food and cake for your guests. 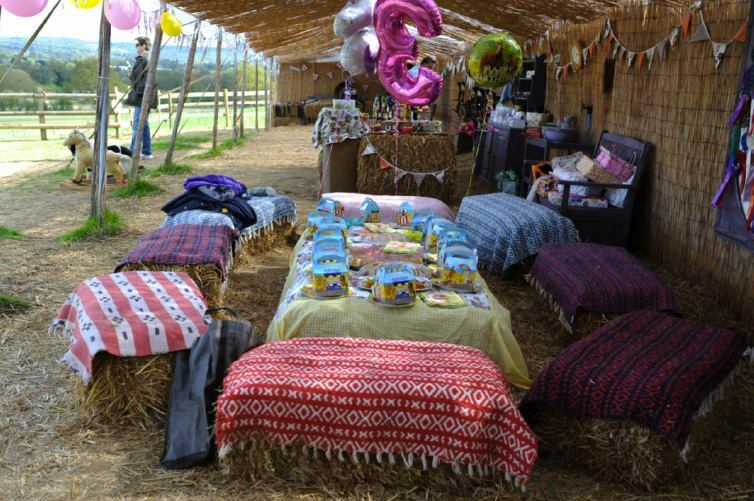 We decorate the ranch with balloons, a party table cloth and bunting. We will help serve the food, provide coffee for your adult guests, and clear up afterwards! 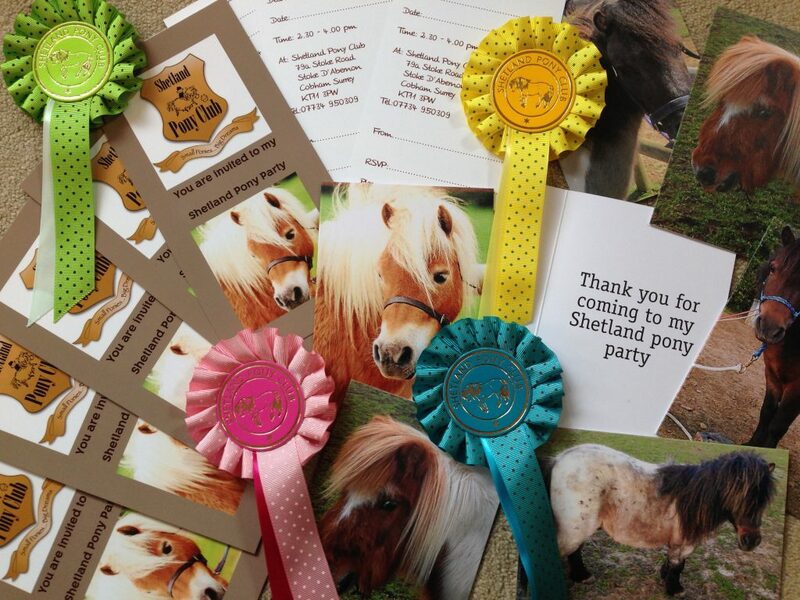 We will supply beautiful invitations, and thank you notes for your Shetland Pony birthday party. We can supply lovely rosettes – either personalised or our Shetland Pony Club ones. Our online shop has our School Trot Book which are very popular for extra special party bags. 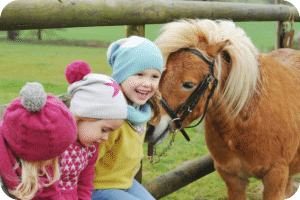 Our pony parties are costed for ten children and we advise parties of up to eighteen children. We have six ponies on duty at each party. We will ensure that each child gets plenty of riding. Should you need more guests, do call us to discuss the practicalities. Adults can stay and join in the fun if they wish. We require a permission form for each child before they can ride. The ranch is closed to all other activities during your pony birthday party. £495 for up to 10 children and £24.50 for each additional child (we suggest a maximum of 18 children). £100 deposit at time of booking. Saturdays and Sundays 2:30pm – 4:00pm. To inspire you, watch this mini film showing 50 fabulous pony cakes from parties at Shetland Pony Club. All these cakes were made by our wonderful parents for their pony parties with us. We advise a visit to the ranch before your birthday party, so you can be familiar with our location and ponies. Its a good idea to book a Starter Ride or Pony Morning in advance, so you know what to expect. We are very popular and would advise early booking. These are just a few of the kind letters we have received about our Birthday Parties and some fun videos that you have made of your times with us. Thank you for a lovely birthday party! Everyone had a great time and the staff was so helpful. We all thoroughly enjoyed it! Here is a video my mom made. I thought you’d like to see it. 🙂 The girls are already missing the pony club. They are looking forward to coming there next spring. Here is the video that Spiro made of the day- I thought you might enjoy seeing it. Words fail me – which is unusual. We cannot thank you enough for such a magnificent time today. You and your staff were amazing and the party was incredible. Everyone thoroughly enjoyed themselves , especially Hana. I have had so many texts this evening confirming this – I couldn’t fault the entire event. You made Hana’s 5th birthday so special and a day that 13 little ladies will never forget. Just a quick note to say a massive THANK YOU to the team who looked after us at pony club today. Izzy had the best birthday she could have ever wished for, with the ponies she loves so much, a dream come true! My husband and I were very impressed by how effectively you managed a large group of 17 children and as many adults. The organisation was superb and everything ran to perfection. Your staff were very professional and extremely helpful. They did everything possible to make sure Izzy had a great time. The children were very well looked after whilst the parents were able to relax and enjoy a drink. As a parent who is somewhat apprehensive of hosting large children’s parties, I can honestly say I had a completely stress free experience an it is all thanks to your attention to detail and your great team. Many of the parents have already expressed how much their children enjoyed the partly. I am sure this will be a party to remember for a long time! Thank you and we look forward to many more rides at the Shetland Pony Club. She is still talking about the fun she had (even thought she was silent for most of the experience) and every horse she see’s is held up against Honey bee and I can tell you most of them don’t come close to him. Thank you for such a great experience – I’m sure we will be seeing you again soon. I just wanted to say that we’ve had a fantastic response to the party. I’ve had so many mums come up to me this week saying its the best party they’ve ever been to! Nicola, Florence’s mum thought you were really well organised and did a fabulous job so just wanted to pass it on really! I just wanted to say a huge thank you to you for Molly and Sam’s birthday party. We had a wonderful day and you and your staff were delightful and a great help. The kids and parents were also amazed at how I’d discovered such a gem so top marks to me! No doubt Molly will be back in the summer to see you all as she loves the ponies and we will let Sam come along too if he’s keen. I just wanted to say a huge thank you to you and the team who looked after us this weekend – all the children had a great time & the parents too. Once again I wanted to say thank you to you and your team for giving Roshi and Teva such a great week. They really enjoyed themselves and are already talking about when they can come back. You have the perfect setup at the club with lovely ponies and have brought to life every little girl’s dream. Thank you for putting on such a lovely party. It was a super bonus for your staff to organise the drinks and tidy up for us, it meant we could concentrate on our guests. I came along with my Granddaughter Sky on Saturday. I want to say a great big thank you. All your staff are friendly, helpful and lovely particularly Helen who was our guide and of course Honey Bee, Sky had a great time. Although we do live quite a way, we will be visiting again. Thank you for organising such a nice Pony Party for my daughter Amy Sunday afternoon. Everybody was being very helpful and kind to the children who all had a marvellous time. For the first time I took my 7 year old (Shadi) and 4 year old (Kiana) for a pony ride today. I was so pleased with the level of service I received from the personnel (Alec and Serena). They were so kind and made a lot of effort to encourage my children to ride the ponies. I highly recommend you to all my friends and other mums at school, and what a lovely place you have. It was nicely decorated. My children can’t wait to go back. Thank you for making the first experience such a joy. I want to thank you for the great experience Gregorio had with Gordon and all of you. We have all really enjoy it. Thank you and your helpers for a great afternoon, thoroughly enjoyed by all! I cannot believe how time is flying by and we are moving away! We will sorely miss the Shetland Pony Club. The girls have had such lovely times there, riding, meeting friends and ponies and having parties. It’s also really helped in building their independence and confidence and giving me some one on one time with them. This has been invaluable and we are very grateful to you. Our daughter has been riding at the Shetland Pony Club in the summer and she has not stopped talking about that unique experience. She went on Honeybee and loved it so much. Thank you all so much for the most magical day yesterday. Despite the rain Daisy and I had a fabulous day! We will be back soon. We hope! Thank you everyone at The Shetland Pony Club for an amazing 4th Birthday Party; such a magical day. A huge thank you to all you lovely ladies & gents for a fabulous week at the pony club! Alicia has had an amazing week with you & her favourite pony Creme Brûlée! We will be back to see you very soon. Thank you for a wonderful 5th birthday party! We as a family want to say a huge ‘Thank you’ to everyone, Rosemary, Rosemary’s Mum, Serena and all the staff for such a wonderful and fun experience at the gymkhana on Monday. We appreciate how much hard work was put into the event.